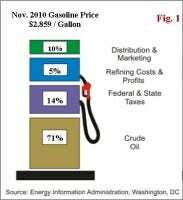 Crude oil is the biggest component, and accounts for about 71% of the price of gasoline as of Nov. 2010, based on EIA estimate (Fig. 1). Roughly, for every one dollar increase in the per barrel (42 gallons) price of oil, gasoline prices rise 2.5 cents per gallon. So, a ten-dollar rise in crude price per barrel would add about 25 cents at the pump. This new gasoline high came just as crude oil also reached a two-year high as traders bid it up after U.S. Energy Dept. reported a week-on-week inventory draw, while unusually cold weather in the United States and Europe has also helped. Oil futures for February delivery rose to $90.48 a barrel, the highest since Oct. 3, 2008. Prices have climbed 14% this year, and up about 26% since late August. And by the way crude oil prices are climbing; you'd think there's a supply shortage. Blinded by SantaMeanwhile, many analysts, including the EIA, attributed the run-up in crude prices and the reversal of historical pattern in gasoline prices to strengthening global product demand and firming economic growth in the U.S.
An above $3 a gallon gasoline price during the third week of December was last seen in 2007-- one year prior to the financial crisis. The last time, any time during the year, the national average for regular unleaded was above $3 was in 2008, when crude reached an all-time high of $147 a barrel! Bear in mind, the unemployment rate was 4.6% and 5.8% in 2007 and 2008 respectively when gasoline was above $3 a gallon, and there was actually a global supply crunch due to robust (pre-crisis) global growth. In contrast, here we are in 2010, barely out of the Great Recession, the jobless rate is hovering around 10%--twice the levels in 2007/08--while the housing sector remains under intensive care with existing home sales down 27.9% year-over-year in Nov. So, it begs the question-- what's wrong with this picture? How could crude oil and gasoline be at this price level given ample supplies, and a lack luster macroeconomic condition? 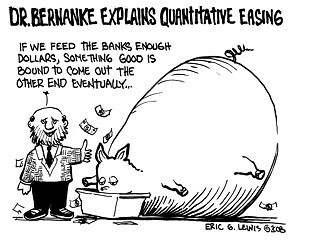 As discussed before, one thing the U.S. Fed's QE has accomplished is building up concerns about the possible inflation. Expectation of inflation, improving global growth, and increasing risk appetite because of the U.S. Federal Reserve's QE pumping up the economy, have driven investors to plow money into the commodities and stocks at a record pace. This massive QE liquidity is also a major factor in the current strong correlation between WTI crude and S&P 500--another reversal of historical pattern. So, it is no coincidence that the S&P 500 index also hit its highest level since the collapse of Lehman Brothers. The broader equity and commodity markets, including crude oil, are artificially supported by the U.S. Federal Reserve, and largely detached from the market demand and supply factors, where traders/speculators will run the show at least through 2011. Most agencies forecast the world oil demand to outstrip supply in the long run; however, during next year, there could be a lot more downside possibilities than upside surprises. And don't count on a U.S. recovery to be the upside surprise factor either. 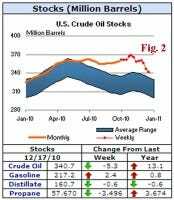 The EIA Short-term Energy Outlook published on Dec. 7 projects gasoline consumption in the U.S. to increase by 0.4% and 0.8% in 2010 and 2011 respectively. Nevertheless, if the stars are aligned, that is, global economy really picking up stream with two consecutive months of good U.S. jobs numbers, inflation concerns and QE could form a perfect storm for crude to hit $110 to $115 a barrel late March or April next year, after a few retracements, and if it breaks above $100. At that level, gasoline at the pump could hit $3.70-$3.80 a gallon range. ... expect volatility to be the major theme in the New Year with crude oil taking the escalator up, but the elevator down, and a couple of $12- to- $15 moves in both directions along the way.